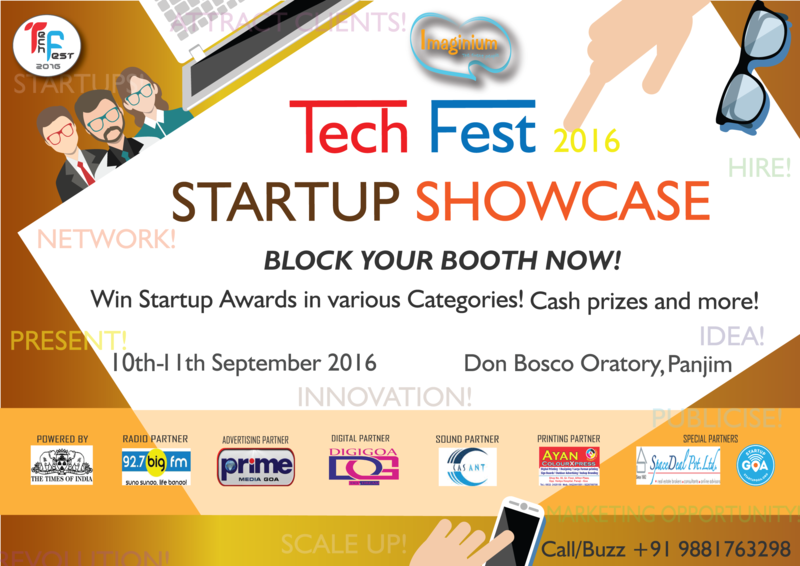 The TECH FEST GOA 2016 is organizing a STARTUP SHOWCASE on 30th September and 1st October at Don Bosco Oratory, Panjim. The main aim of the Startup Showcase is to celebrate the amazing entrepreneurial journeys of startups all across the state and provide them with a platform to network, publicise, interact and even employ, by putting them in the same physical space. The biggest focus of the event are the companies in their growth phase (Post-production) who have already formed and validated their minimum viable product. The curators of this event are giving these Startups the opportunity to present themselves on a larger scale, and giving them the opportunity to grab more clients. Industries all across Goa will be given the opportunity to give sessions and attend the Tech Fest, creating a brilliant opportunity for anyone present to interact with the experts and follow their star entrepreneurs to gain valuable insight and feedback to help them in their development and production. With students from different colleges in attendance as well as members of the general public, companies can take it a step further and offer up internship posts which could lead to permanent hirings or contracts. Companies and startups are encouraged to take up booths to display their ideas and create awareness about job opportunities and career choices in and around Goa. There would be a fee that they would have to pay to get their hands on one. Day one will kick start with the Inauguration followed by the opening of the expo to the multitude. Following this, there will be interactive sessions and briefing of startups participating in the expo. The day will finally end with Startup of the year 2016 award. Day two will include the competition aimed at ‘Best Creative Project’ where students across Goa will be provided an opportunity to present their ideas to officials and entrepreneurs. The winners of the competition will be announced toward the end of the day followed by the concluding ceremony. You can register for the event by giving a call on +91 9881763298 and book a stall for your company. Attractive prizes to be won.